Taekwondo is a traditional Korean martial art and a modern combat sport. Taekwondo was a demonstration sport in the 1988 & 1992 Olympic Games. Then it made its debut as a full medal sport in 2000 in Sydney. Just like the Olympic slogan of “Faster, Higher, and Stronger,” instruction in Taekwondo can help you reach new levels. 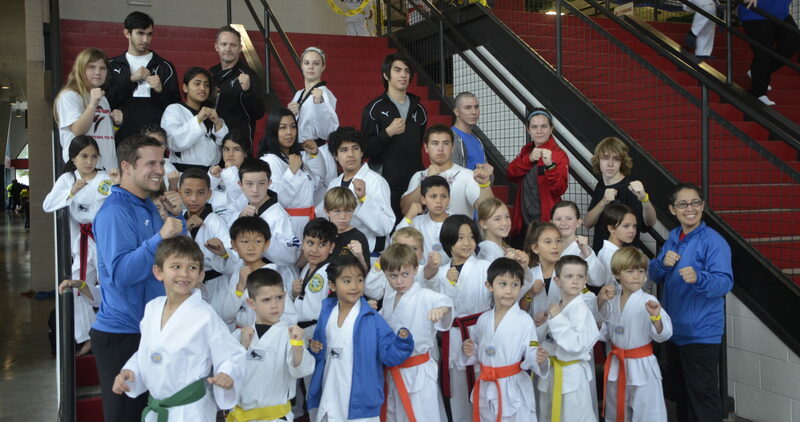 Each student is required to read/understand the rules of sparring in the National School of Martial Arts Taekwondo classes. If the student or parent/guardian of the student has a question or concern about the sparring rules, it will be addressed and fully explained prior to any sparring sessions. The purpose of sparring is (1) to practice technique, (2) to develop and demonstrate control, and (3) to be able to participate in competition sparring in Olympic Taekwondo. Sparring is broken down into two categories: promise sparring and contact sparring. 1. Promise Sparring is performed to develop skill and control. There is NO actual contact, thus the “promise” not to touch or hit each other. 2. Contact Sparring is performed to demonstrate skills/technique during rank promotion test, to practice for sparring competition or during actual competition in a martial arts tournament. Contact must be light and controlled and should be targeted to point areas only. Sparring is conducted under the supervision of an adult instructor. All sparring will begin and stop immediately at the instructor’s command. All sparring will be performed in the training area only.